Fishing is prominent biblical metaphor that is rich in theological implications for evangelism and what some might call “marketing the church.” When I head to the ocean, I generally engage in two types of fishing: pole fishing and net fishing. One is done in the ocean, off of a peer or off the shore – the other is done in the less tumultuous sound where I can wade, scan for schools, and throw and retrieve unencumbered. I have long thought there is great fodder here for reflection. Take pole fishing. It is not an exact science, by any means, but a person who goes pole fishing generally has a “target fish” in mind. 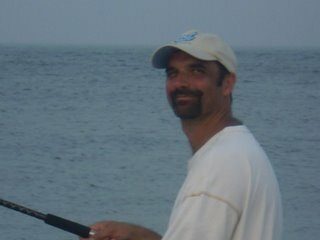 A question to a pole fisher like “What are you fishing for? usually gets a response like … Drum, Spanish mackerel, blues, or flounder. The experienced pole fisher, one who takes the time to get to know which fish are striking what kind of lure or bait, is usually the most successful at catching what they desire. If you want to fish off the bottom, you throw a two-hook rig with a large weight and the desired bait. Prefer to catch mackerel or king fish and you probably need the right lure. 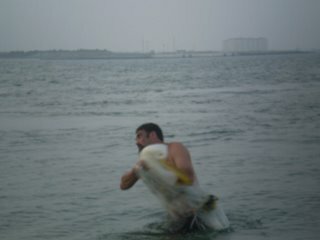 I was net-fishing for silver mullet and what Uncle Roy used to called “jar-head” mullet. If and when I was lucky, that is what I pulled in. But over the years, I have also caught blow fish, sting rays, choopers (fin fish that are the devil to get out of the net), flounder, clams, sticks, sea-weed, barnacle-growing debris, and occasionally other critters unknown to my limited sea creature knowledge. The thing about net fishing is – if you throw it far and wide and get the net open enough, you are going to pull in anything and everything that is beneath it. Net fishing and pole fishing can both bring surprises, but net-fishing generally delivers unexpected results more often. I am convinced that many of today’s church marketeers prefer to use pole-fishing strategies. They determine their target audience and then research what lures or bait are best for catching that type of fish. They may occasionally catch other types, not a bad problem to have … but it may also mean that the place they are fishing and the lure they are using needs to be adjusted some. When I was first getting started as a church planter, I remember talking to an associate pastor of a mega-church in Arizona at one of those new church pastor training events. He was expressing his frustration with people who came to the church each winter that were not a part of the church’s “target population.” Every winter, literally hundreds of “snow bird” families would fill the sanctuary of his church and attend the numerous programs and ministries offered there. He saw the 4-6 months of their presence as a great distraction from the church’s mission, which was supposed to be focused on Gen-X, Millennials, and young couples with children. Retirees traveling south to avoid the harsher winters in the north were simply not something his church wanted to be bothered with. This was pole-fishing with a vengeance. What would happen if churches decided to let the gospel determine their “target population” rather than the preferences of church leadership? I would advocate that we move back to parish based ministry, with “parish” referring not to a church’s membership roll, but the geographic area in which a church is located. Draw a reasonably sized radius around your church and then net-fish anyone and everyone that lives within it: black, white, Latino, poor, rich, or middle class. What might happen if the only homogeneous principle in a congregation was Jesus and not race, age, income, or class? So what does fishing with a net look like in a local church? I am not sure I have all the answers, but it may, ironically, include pole fishing your parish. The difference is, the net-strategy moves from “target population” to “target area” or “parish.” Inviting people in a gated community with “no solicitation” signs will look different than building trust and relationship among the poor who live in sub-standard housing. At Reconciliation UMC, we strive to employ numerous means of welcome, invitation, and hospitality, realizing that what works for one community in our parish may not work at all for another. Perhaps one example may illustrate this point. Several years ago, our church decided to start a Spanish language ministry to reach the growing Latino population in Durham. We targeted a couple of apartment complexes in our parish that are mostly Latino. We had discovered that mailers, fliers, and other advertising accomplished nothing with this community. We needed to build relationships based on trust and mutual friendship. In an effort to do so, we decided to do a door to door survey, letting folks know we were contemplating a new Latino ministry in the area. Questions included things like: Would you be interested in a new, Spanish language ministry in the area? If so, what kind of things do you think need to be addressed in your community? We decided to go door to door in teams of two, with at least one bilingual person on each team. We had cards and fliers in Spanish, just so we had some material to give to people who asked. Every hour we met back at a central location to compare notes. After the first round, one team’s report was illuminating. Even though the apartment complex was 98% Latino, they had been unprepared for the English-speaking family that answered the door at one apartment. The family was very interested in a multicultural church, but our team had nothing to give them in English – even though the only things we had going at our church at the time were in English! For a congregation committed to a net-fishing strategy, it was a gentle reminder to always expect the unexpected. For the record, I am not against targeting various communities in a parish for evangelism, mission, and witness. I like both pole fishing and net fishing. I just think that we don’t do either to the exclusion of others who need Christ in the same community, regardless of whether they are on the other side of the rail-road tracks, listen to a different kind of music, or eat a different type of food. >excellent post- affirming my views as a post-modern evangelist- we have to step away from targetting methods and cast the gospel far and wide- thank you!